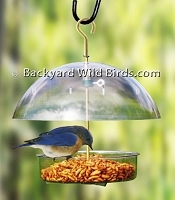 Bluebird Mealworm Feeder tray with adjustable Pale Blue Dome above, great bird feeder for serving Bluebirds mealworms. Birdwatchers Choice Mealworms are bluebirds favorite Mealworms! These Bluebird Mealworm Feeders feed Bluebird's their much desired mealworms in style!